I’ve become an Instagram troll this week. Until I started following people I didn’t know personally (for recipes, etc. ), I didn’t realize the power of seeing what posts your friends liked. By golly, it’s fantastic. I’ve found more recipes, a coconut butter company I placed an order from and some fitness Instagram accounts. The power of social media is definitely substantial. While perusing through new accounts and photos, I found a simple recipe I had to try: Zeggs. 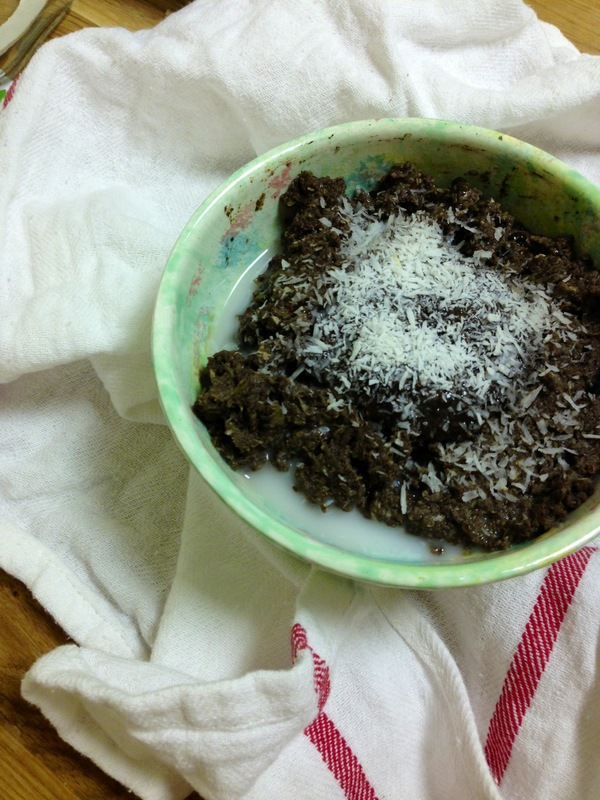 I had seen the idea of n’oatmeal before from a few Paleo blogs but zeggs was new. To be honest, the idea seemed a little weird to me at first. Then, a cold morning came and I was craving oatmeal. I decided to combine the fundamentals of both into a breakfast that feels too indulgent but is perfectly healthy and delicious. From now on, I think I’m going to call it Zorridge. I know it looks like a bowl of mush but trust me when I tell you it tastes like chocolate pudding for breakfast. 1/3 of a large zucchini, peeled and grated. Begin by preparing everything as the process moves quite fast. Crack the eggs into a bowl and add the vanilla extract. Beat eggs with a fork until combined. Put zucchini, pumpkin, flax, cocoa powder and cinnamon in another bowl. In a pot over medium heat, bring the water to a boil. Add the bowl with the zucchini and stir to combine everything. While stirring, pour in the eggs and continue to mix. Continue stirring for approximately 4 to 5 minutes or until the mixture isn’t as wet and starts to boil. I sometimes put a lid on the pot for an extra minute to steam and ensure everything is cooked through. When the mix is puffy and no longer as wet, transfer to a bowl. If using optional ingredients, top with chia seed pudding, drizzle with milk and sprinkle with coconut. This entry was posted in Recipes and tagged breakfast, chocolate, coconut, delicious, dessert, diet, easy, eat, eggs, food, gluten free, health, healthy, nutrition, oatmeal, paleo, porridge, sugar free, zorridge. Bookmark the permalink.